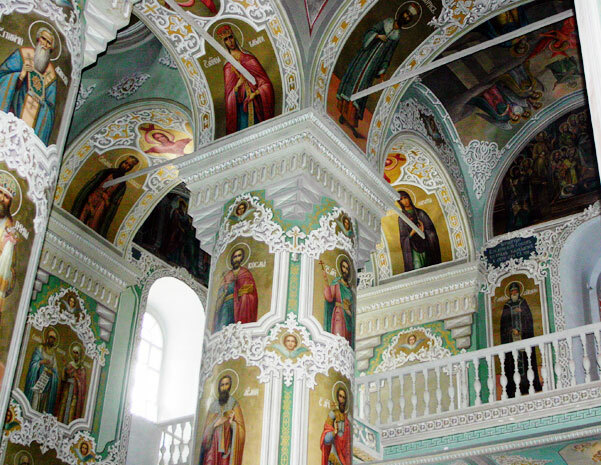 The cathedral, built aside the destroyed <?xml:namespace prefix = st1 ns = "urn:schemas-microsoft-com:office:smarttags" />palace of Khan and the demolished mosques, is a masterpiece of the ancient Russian architectural tradition of cross-domed churches. Initially, it was the stone five-domed and three-apsed church supplemented in the end of the 16th century with two attached side-chapels in honor of SS. 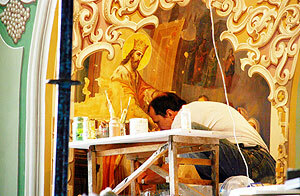 Boris and Gleb and Miracle-Workers of Murom. The ancient church had helmet-shaped domes. 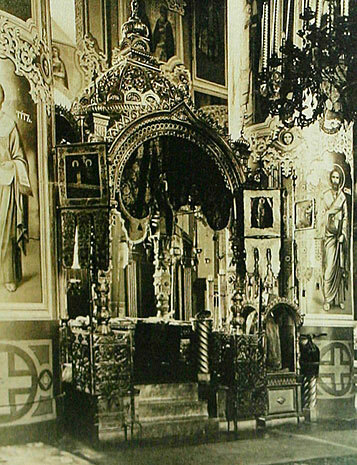 Within the 16th and 17th centuries its interior was decorated with fres­coes, the fragments of which are left preserved in the western part of the temple in spite of many fires that hap­pened in 17th and 19th centuries. 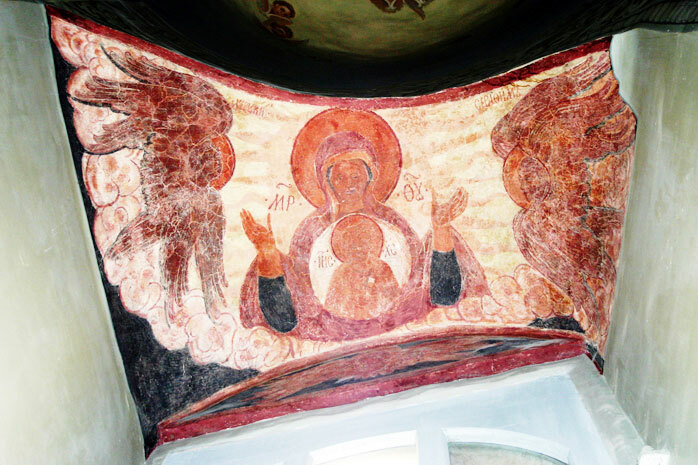 In particular, during the restoration works in the 90s of the 20th cen­tury the most ancient fresco icon of Our Lady of Kazan of the 17th centu­ry was discovered. The stone five-circled bell tower was attached at the end of the 16th centu­ry. For three centuries it underwent numerous reconstruction works and lost its original outlines. 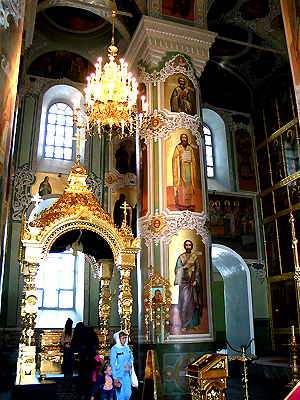 Its bells aston­ished everybody when he entered the Kremlin. The bell, placed in the lower circle of the bell tower was the largest bell of the ancient Kazan, it weighed 1500 poods (approximately 24 570 kilo­grams). Beneath the belfry there was a temple built in honor of St. Martyr Irina. 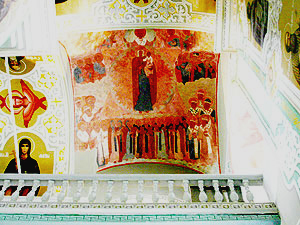 It was shut down owing to its dilapidation and restored with the merchant Chizhov's sponsorship only in 1832, when it was consecrated in honor of St. Herman, the second arch­bishop of Kazan. The bell tower of the Cathedral of Annunciation was damaged and dismantled in 1928. In 1736 a one-storeyed made of brick refectory was attached to the western part of the cathe­dral. 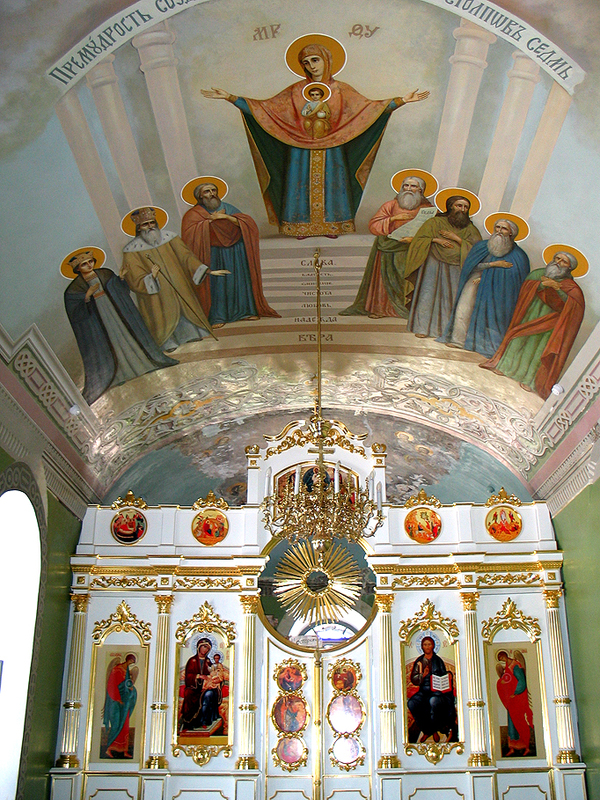 Its helmet-shaped cupolas were replaced with the onion-shaped ones, and a dome of the church was completed with the baroque decorations in Ukrainian style. In 1815 the fierce fire damaged the whole Kremlin of Kazan and caused thorough restoration of the church. From 1817 to 1821 the semi-destroyed part of refectory underwent reconstruction and was joined to the archbishop's house with a sheltered gallery, in 1841 the refec­tory part was reconstructed. It obtained a storey, a staircase leading to the gallery, and became double lighted by the project of F.I. Petondy. 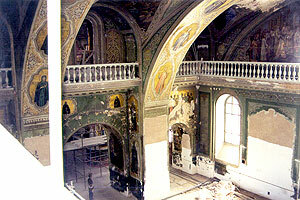 Simultaneously, the cathedral was supplied with a heating system that it had not had before. The new refectory part considerably changed the appear­ance of the ancient church, but it was taken as a basis for the reconstruction project of 1977. In the 40s of the 19th century a high-roofed porch was attached to the main entrance. In 1863 the safe depository for the splendid sacristy of the church was built-in at the western part of the refectory. sakkoses of the marvelous sewing by Strogonov's school included, the metropolitans’ klobuks and caps decorated with precious stones. 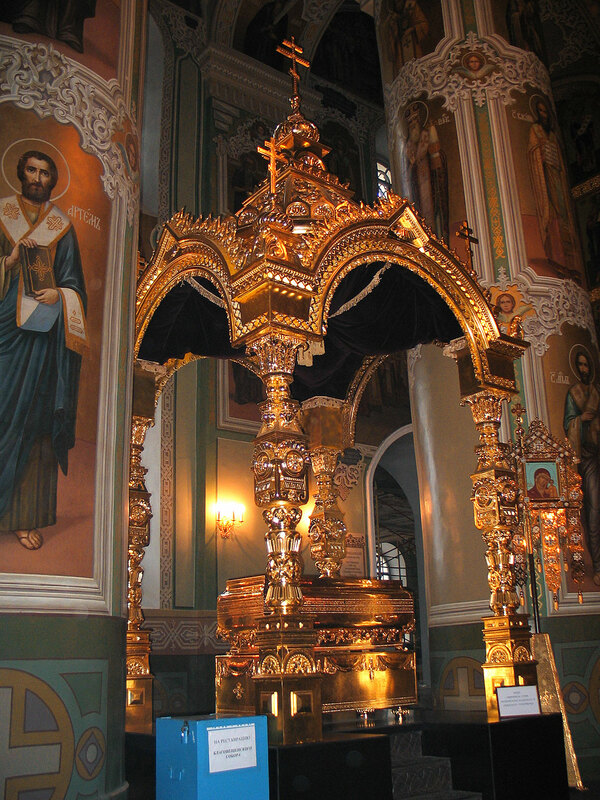 The vestments of Laurentius and Tikhon, the metro­politans of Kazan, were especially valuable. The total weight of the met­ropolitan's canonical dress of the 17th century reached 40 kilograms. 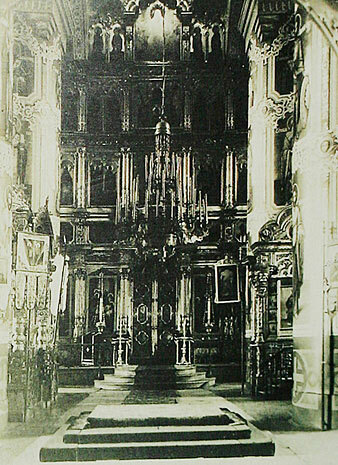 In September 1919 the officials of Cheka detected the cathedral sacristy and intended to confiscate it for the subse­quent utilization, «since it was not history-making». However, due to the histo­rians of Kazan P.M. Doulsky and I.A. 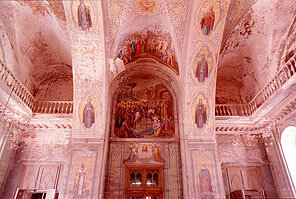 Stratonov, the sacristy was retained and transferred to the custody of the State Museum of the Kazan province. Later on the major part of the sacristy disappeared without a trace. The church possessed the most valu­able collection of the old-printed book and hand-written manuscripts of the 16th-18th century. 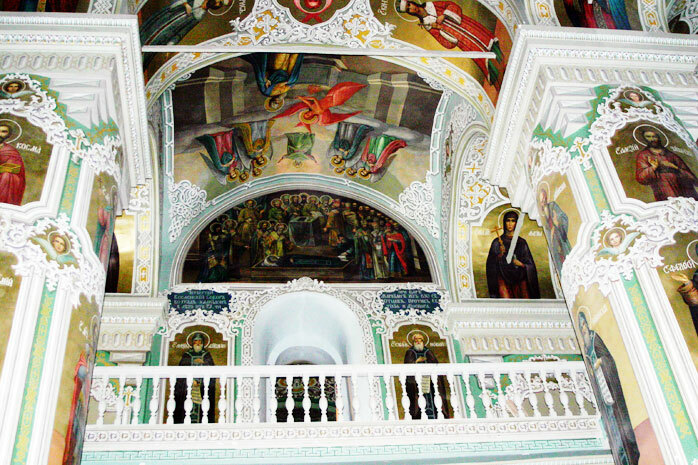 The considerable number of manuscripts and books in Cyrillic alphabet that are at the dis­posal of the State University of Kazan are derived from the funds of «The Kazan primary Cathedral of Annunciation». The hand-written mark «K.C.» (The Kazan Cathedral) can be seen on the books. The distin­guished persons and the ecclesial hierarchs donated a great number of those books. The so-called Euthremius’ Evangel reached our days and became one of the most valuable samples from the cathedral collection. 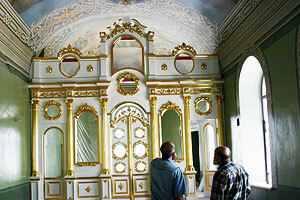 They are кеpt in the State United Museum of the Republic of Tatarstan. 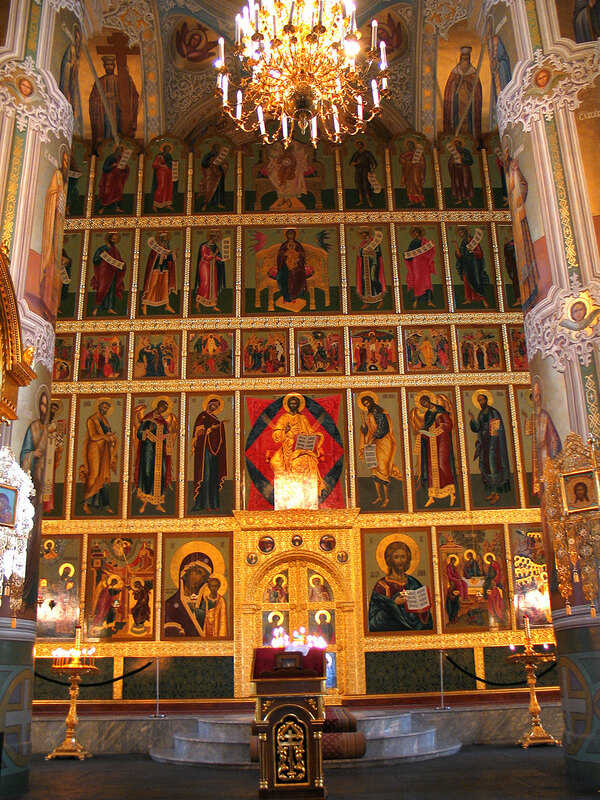 Illustrated with highly artistic miniatures, this Evangel was worked out in 1606 and was donated to the cathedral by Euthremius, the metropolitan of Kazan. In 1613 Mikhail Romanov, the first tsar of the Romanov’s dynasty, was coronated for the reign by Euthremius. The appropriate records written in the Evangel offer an elo­quent testimony to that historic event. fresco paintings. 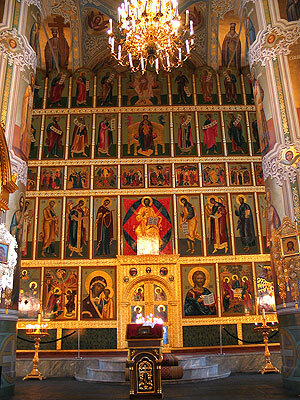 That relates to well-known events: the finding and the ceremony of glorifying of the Kazan Icon of the Mother of God; the ceremony of consecration of Archbishop Gury by Metro­politan of Moscow Makarius; the finding of the holy relics of St.Gury and Varsonophy by Metropolitan Hermogen (to be the next Patriarch). On the vault and walls of the cathedral's refectory there are images of the saints in whose honor the churches of Kazan were consecrated, the images of SS. 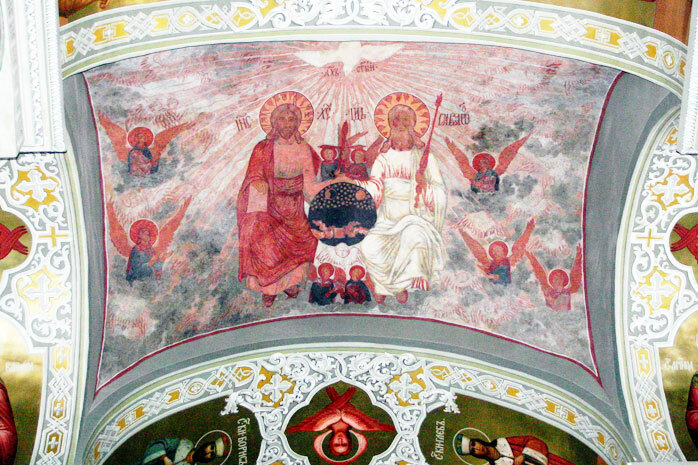 Cyprian and Justinia, the martyrs of Kyzicus and the orthodox princes Feodor, David, Konstantin, etc. At the beginning of the 20th century the cathedral was sufficiently reconstructed. 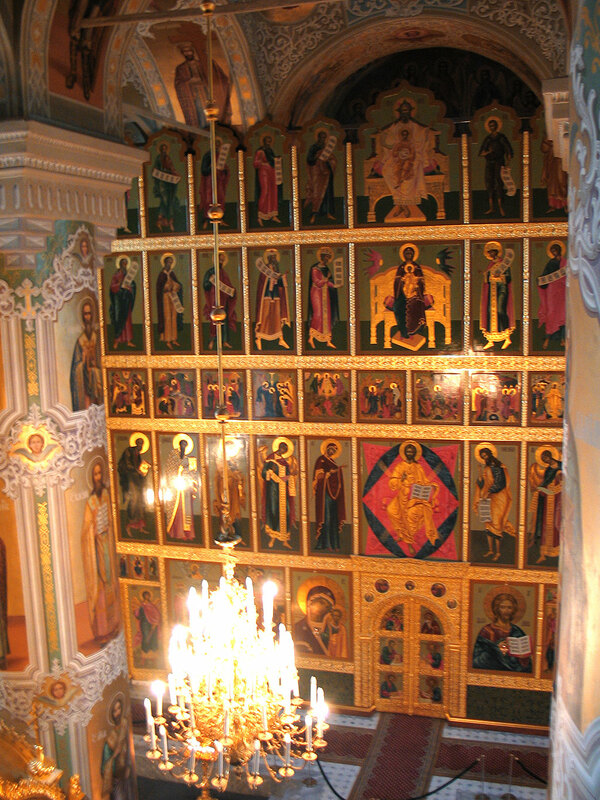 The side-chapel, the temples and the bell-tower were refreshed and repaired, the top crosses were gilded, and the heating and ventilation systems were installed. 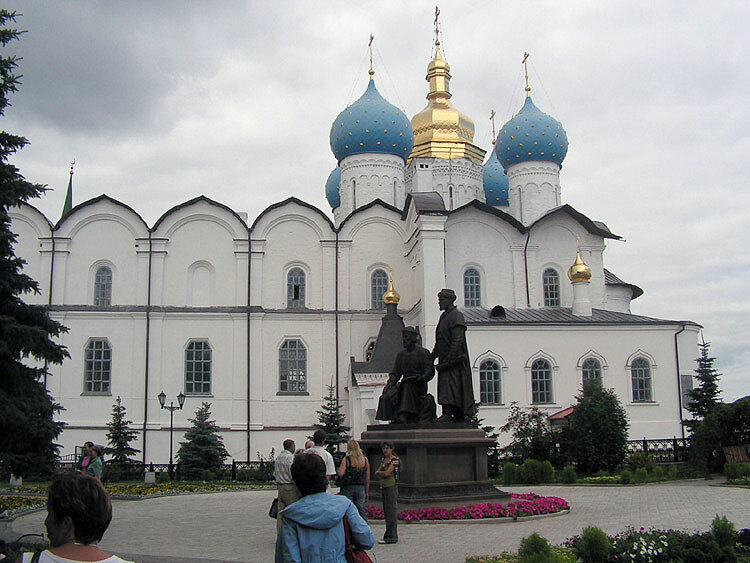 In September, 1918 some of the priesthood, including Metro­politan Iakov, the arch-priest of the cathedral Andrew Yablokov, who was the author of a book on the cathedral printed before the Revolution, left Kazan along with the White Czech’ s regiment. 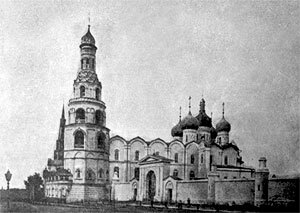 From September 1918 to May 1919 the cathedral was shut down and sealed up for the reason that the Kremlin was declared a mili­tary garrison. Nevertheless, the authorities gave the permission to take out of the cathedral the most honored icons and sacred things, including the reli­quary of Archbishop Gury. 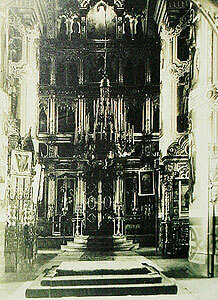 The cathedral performed its duties from May 1920 to September 1925. By the resolution of the Central Executive Committee of the Soviet Socialistic Republic of Tatarstan dated September 20, 1925, the cathedral was shut down and trans­ferred to the State Archive that occu­pied the cathedral premises for the archival depository. It was a real sal­vation for the ancient cathedral. 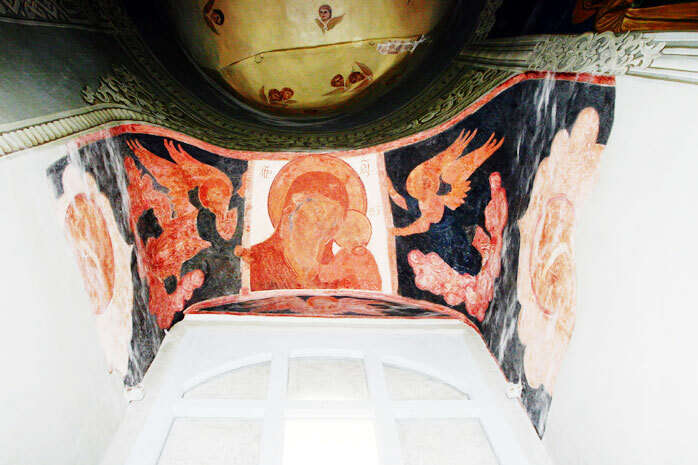 Its fresco paintings were constantly pre­served under the favorable tempera­ture conditions till then. Only several «tablets» (double-sided lectern icons) of the 18th century remained from the voluminous collec­tion of icons. 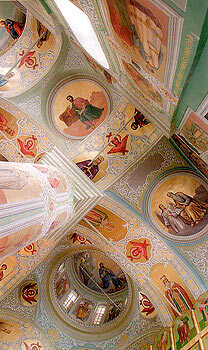 Nowadays they are kept at the Fine Arts Museum of the Republic of Tatarstan. Unfortunately, the cathedral was par­tially damaged. The bell towers, the domes, the top light drums, the shel­tered porch of the western side were pulled down after the restoration works in the 70-80s. However, the external aspect of the cathedral (except the bell tower) was basically restored. 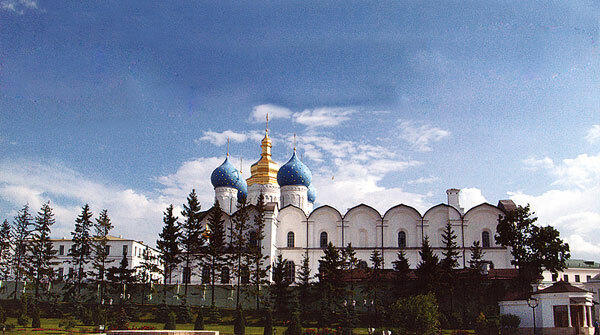 In 1995, accordingly to the edict of Mr. Shaimiev, the President of the Republic of Tatarstan, the estate of the Annunciation Cathedral was transferred to the authority of the State Historical and Architectural Museum-Preserve «The Kremlin of Kazan». To carry out the complex reconstruction and the purposeful restoration works, the foundation for financial support and reconstruction of the Cathedral of Annunciation was established. The Diocese of Kazan advised to the developers of the theo­retical concept on restoring the Cathedral of Annunciation. 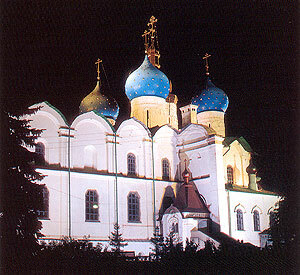 After many years of reconstruction and restoration works the Cathedral was solemnly consecrated by Archbishop Anastassy of Kazan and Tatarstan on July 19, 2005. It was opened on July 21, 2005, on the feast days of celebration of the 450th anniversary of the Kazan diocese. The jubilee celebrations officiated His Holiness Alexy II, the Patriarch of Moscow and All Russia. In present, the Cathedral is open every day, the Divine services are held on the feast days. 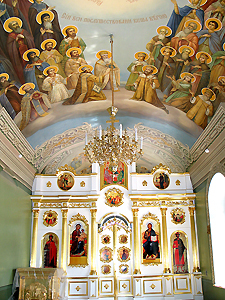 The rector of the Cathedral is Archbishop Anastasy (Metkin). The Divine services are held on Sunday and on the feast days.